estate. Foreclosed homes were families were forced to leave isn't "free market". Invaders have always been envious of native land. How can you buy land with stolen money? Let's call gentrification what it really is: kill for profit capitalism, pink infestation, modern day genocide. If you see a tanning salon in the hood you know the end is near. #GENTRIFICATION IS GENOCIDE. When pale people move in they want Black people to move out.... or die. 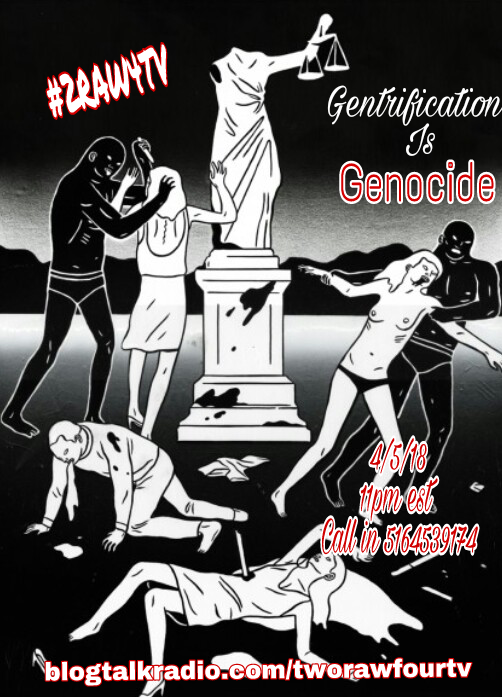 Next #2RAW4TV we will discuss how close Gentrification is to colonialism, how to deter and destroy gentrifiers, and how we will end gentrification TODAY! Don't sell out, tune in! This Thursday!